From the moment I started to listen to this album, I was overwhelmed with an exploding chaotic sound that is frustratingly angry while sustaining optimism for the future. 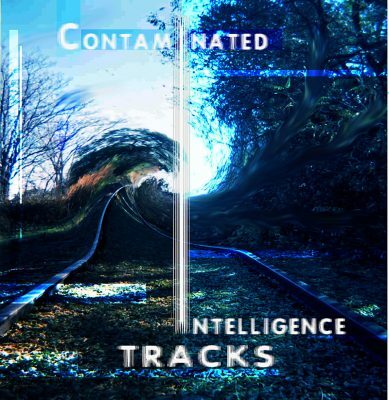 Contaminated Intelligence’s TRACKS is very complex both in style and content. From the harsh, distorted vocals to the thrashing drums and industrial-inspired synth riffs, I found myself really needing to listen to this album over and over to get the full effect. The first track, “Luggage,” is a beautifully constructed instrumental soundscape that ties in nicely with the second track, “Crossing Paths.” “Crossing Paths,” however, takes a dramatically hard industrial turn of distorted echoing vocals and chaos-inducing synth. “Cutting Ties” is a track that has every element you would want or could expect from a hit industrial song. I thoroughly enjoyed this album, but I did have a few constructive criticisms. Some of the lyrical content is rather heavy-handed. “Beyond the Next Bend” is a great track with a great message, but the lyrics come off as an angrily written blog post. Some more time could have been put into the lyrics on this song—ambiguity can often enhance a strong political message. My only other criticism is that I would utilize a different variety of vocal effects. I love the vocal effect, but used in every song, it can lose its allure. The production on this album is fantastic, though some tracks seem to have been too heavily compressed or too finely produced. Industrial music’s strengths lie within its imperfections and ability to layer element after element. They even sampled one of my favorite movies, Return to OZ; and “Haunted Dreams” used a clever sample that really gave the track a new dimension.